What’s better than a casual outfit you can still feel stylish in? A cute, casual, and stylish outfit thats completely ON SALE!! Thats right, everything I’m wearing is on sale for a killer deal! This blouse is one of my favorites and I may or may not have worn it a few times before taking pictures (bad blogger, I know) but I couldn’t help it. Its flattering, comfy, and can be worn so many ways. I chose to pair it with a simple gingham top (30% off with code GOSHOPPING ) some distressed white denim (also on sale) and a simple pair of white sandals (buy on get one 50% off). I don’t know about you, but I love a good deal and rarely buy anything full price. If you are a fellow deal lover, than make sure to out my top picks from the Nordstrom Anniversary Sale below. This sale just keeps sucking me back in! Love this casual look! Love the mixing of two trendy patterns. Love this sale!!! Your top is so cute! Oeh! Sale; yay! I love this outfit. The light colors of your t-shirt is gorgeous! What a lovely mix of prints! I really like the final result! You look so chic and stylish. I adore this combo and you did a fantastic job styling. I especially love your pink top! I am in love with this comfy and colorful combination! You look darling! Fantastic look! I don't blame you for wearing the blouse ahead of time–I would too. 🙂 The gingham looks so great with the pale pink and white blouse. Have a blissful day! You look great! Love the haircut- flawless! I love a comfy and stylish outfit!! Such a great look! 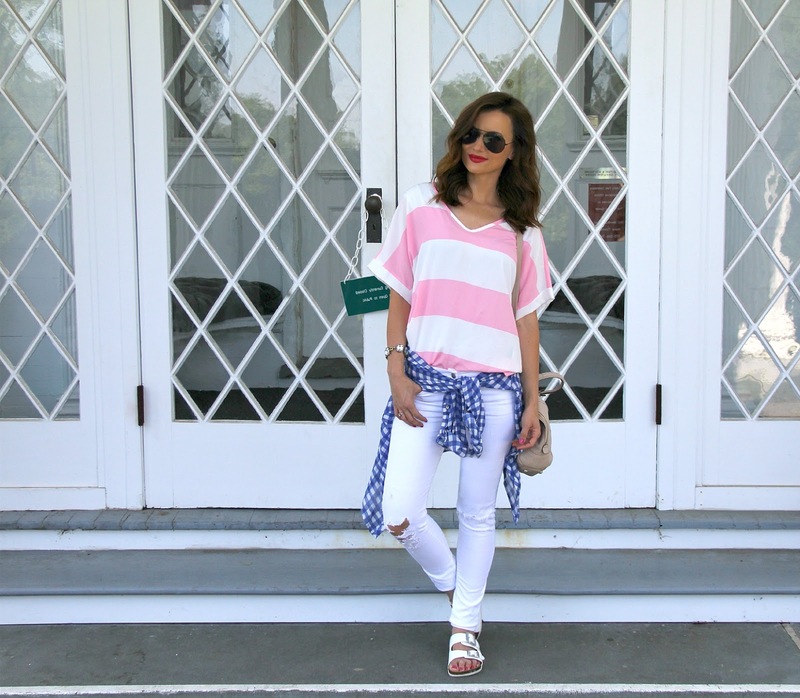 I love the combination of pink striped Top and blue gingham shirt!